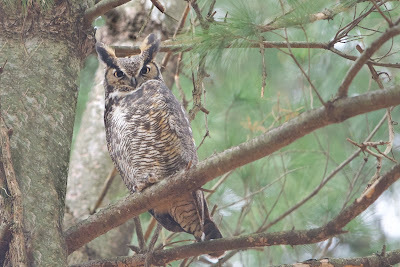 I was quietly walking the path in the woods in Valley Forge yesterday looking for the owl. As I was looking up, there he was looking down at me on a very low branch with eyes wide open. So close he took my breath away. I whispered, "Please just stay there while I set up my tripod and take your picture." As I bent down to look through the view finder, he was gone -disappeared silently in an instant. I looked around and there he was on a much higher branch a few yards away. I asked him to please hold on and let me get a better vantage point. He said O.K. and I stepped over a few fallen logs, set up my tripod, talked to him a little more and took his picture. Oh, this beauty - hope there is a family coming soon to the woods in Valley Forge.